Monomania: the single minded pursuit of only one thing. We set out to explore a high place in Mono County: Bloody Mountain. 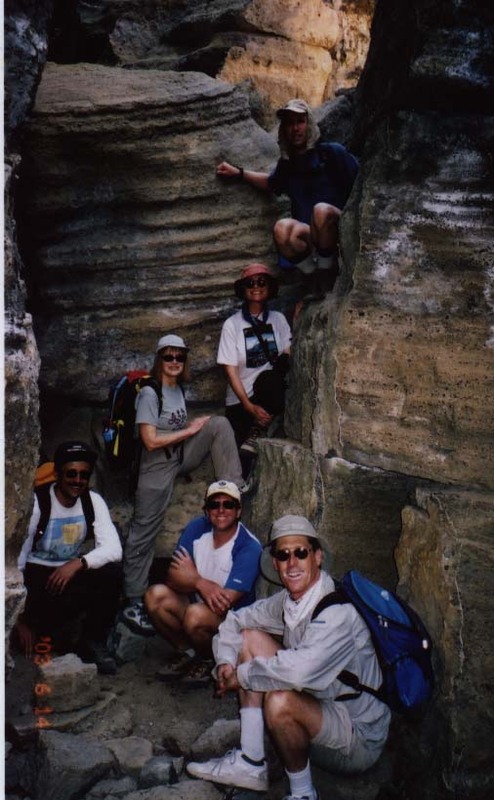 Jim Ramaker and I were the leaders of this expedition, and we were accompanied by Kai Weidman, Cecil Anison, Liz Harvey, Debbie Benham, Tom Driscoll, Nancy Fitzsimmons, Anthony Stegman, and Alex Sapozhnikov. Friday night, on the way out to our reunion point, Tom, Nancy and I stopped at the south shore of Mono Lake. It's much saltier than the ocean, but although it can't sustain fish, it is not a dead sea. Mono Lake teems with brine shrimp, and supports a huge winter colony of California Gulls. Underwater mineral springs create towers of precipitates, known as tufa. The lake is much smaller than it was in the fluvial age thousands of years ago, and today towers are exposed on the lake shore. We hiked past dozens of these fossilized mineral springs, each twenty or thirty feet high, puffy in form, resemblng stalagmites in caves. Under the platinum glow of the full moon, the tufa was other-worldly. We camped at the plush National Forest campground at Convict Lake, and in the morning, met the rest of our group at the base of Laurel Creek Road, where it joins Sherwin Creek Road. We had read accounts of other people who had driven up Laurel Creek Road all the way to 8400 feet, but neither Kai's car nor my car could handle the deep ruts. We drove only about 1/2 mile, and started hiking at about 7300 feet. We followed the road until we stood under the saddle between Laurel Mountain and Bloody Mountain, then headed cross country for the gap. Monolith: a single, unbroken tower of rock. If you want to climb a monolith, head to the Palisades instead. We walked up the shattered shale slopes of Bloody Mountain. Jim and I had pre-arranged with the national Sierra Club for approval to climb with ice axes and crampons, but by the middle of June, the shale fossils of Bloody Mountain were dying of thirst. There were a few scanty patches of snow, but we only made about 100 footprints each. We reached the saddle. Monoxide: never breathe it. The sweet desert air hung around us still and warm and aromatic. Nancy climbed Laurel Mountain, and the rest of us continued up into the atmosphere of Bloody Mountain. We stood on the 12544 foot summit and admired the view far below. Monotone: not very tuneful. As we hiked down, we belted out every Beatles number we could remember, and we knew a lot of them. Rocky burst in, grinning a grin, and said, "Danny Boy, this is a showdown!" We all live in a yellow submarine. Give peace a chance. We collected Nancy back at the saddle. We hiked back to the cars. At the place where the use trail meets the rugged road, Liz dropped her trekking poles. Find those poles and return them to Liz, and she'll take you to dinner, some place nice. This Saturday night we cooked dinner at our campsite at Convict Lake. Noodles. Chili. Mashed potatoes and powdered gravy straight from the envelope. Mono sodium glutamate. Gourmet camping food. Porter. Liz promises something much better. Monogamy: one mate for life. Did I mention that Tom and Nancy are getting married in January? Mazel tov, Nancy and Tom! On Sunday, Jim and Cecil stampeded up Mount Morrison. Kai relaxed at the camp ground. The rest of us abandoned our mad plan for a second 5000 foot day to Mount Baldwin, and instead rode up to Mono Lake. Kai recommended that we hike up Black Point and explore the fissures there. If you want to see this wonder for yourself, take highway 395 north from Lee Vining to the clearly marked right hand turnoff for well-paved Cemetery Road. You'll pass the old boneyard in about a half mile, and then the road becomes unpaved but graded. Several miles further (sorry, I didn't watch the odometer), at 6500 feet of elevation, a poorly marked right turn puts you on the nameless dirt road to Black Point. At the end of the road there is a parking lot. There is no trail, but the cross-country route finding is trivial. Hike uphill across the cinders to the summit at 7000 feet, about 1/2 mile from the road. The fissures are visible from the top. Continue in a westerly direction for a couple hundred yards, drop into the big cracks in the earth, and then give yourself an hour to experience the interior. Monograph: A treatise on a single subject. The BLM leaflet explains, "Black Point is a volcano that erupted beneath the waters of a much deeper Mono Lake about 13000 years ago, near the end of the last Ice Age. As the cinders and lava quickly cooled and hardened underwater, the top split open to form several hundred-yard-long cracks. These fissures measure from 20 to 50 feet deep and are only a couple of feet wide. Layers of tufa, ash and sediment are visible from inside these fissures. As the fluctuating waters of Mono Lake receded after the Ice Age, Black Point was left as a peninsula. It is said to be the only fully exposed underwater volcano on earth." Inside, the fissures resembled the slot canyons of Utah. It was cool and moist within, generously appointed with flora, even though just outside the desert baked in the noon sun. The clear sky was just a slit above us. I was struck by the realization that while yesterday we were in the Sierra Nevada, today we were in the Great Basin. We had crossed an abrupt boundary between two of the great geological and ecological regions of North America. Monotreme: the platypus and its kin. We found in Black Point an oddity of nature, on the shores of a lake which is itself a curiosity. Our whole Mono weekend was a wonder.